Mobility Without Barriers Foundation recognizes that the promise of equal opportunity, literacy, poverty reduction and basic human rights begins with every child having the opportunity to receive an education. 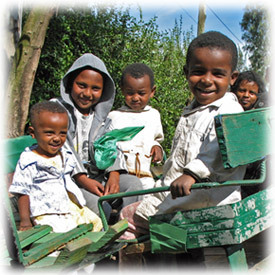 For children in Ethiopia who are unable to walk, the distance between home and school is insurmountable. Regardless of how bright or motivated these children may be, the promise that an education could offer remains largely unrealized. For these children, having an assisted mobility device that is safe, effective and durable represents the difference between the opportunity to pursue an education or continuing to be isolated and marginalized. Thousands of children who have been previously excluded from opportunities to attend school due to impaired mobility are now being screened and registered for enrollment in school. These children will be provided with specialized services and training for operation of the Ethiopia Mobility Cycles prior to beginning their daily rides to school, an average of two kilometers each way. In order to rapidly scale up to reach meaningful numbers of underserved and chronically isolated children, MWBF has designed and built specialized horse-drawn carts. These disability friendly carts transport children with disabilities to and from school in greater numbers, averaging as many as 18 children per cart each day. This also extends the parameters for including children with more extensive disabilities, as well as children with multiple disabilities. The training program for the Horse-Drawn Cart directly parallels the training in mechanical and business skills outlined above. Vulnerable children and youth, with highest priority for those with disabilities, are learning the vocation of beekeeping, honey production and processing to provide supplemental income. This will relieve some of the financial pressures that frequently lead to early termination of a child’s education.